Find lowest airfares on over 100 airlines.. Commonly known as PIA - Pakistan Int Airlines is currently state owned by Pakistan, it was originally established in 1952 and became the regions first airline to aquire jet airliners from TWA trans world airlines America. The airlines Karachi Pakistan based head office was one of the first modern call centre's in the indian subcontinet, it has over 300 staff members attending all types of enquiries from customers worldwide enquiring about flight and ticket infoprmation, PIA is one of only a handful of ailrines to operate a 24 hour 7 days a week 365 days a year fully operational call centre for the conveneince of its passengers. Pakistan Airlines fly direct from all UK airports London Heathrow, Birmingham, Manchester and Leeds Bradford to Islamabad, Karachi and Lahore, there are several connections to domestic airports within Pakistan, these are available to book and have added to your international flight, such as Multan, Peshawar, Quetta and various others. 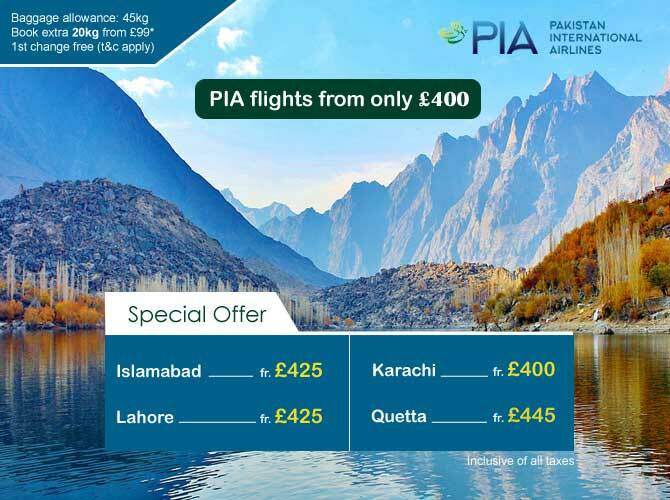 currently PIA tickets can only be purchased through nominated Travel Agents such as Mushtaq Travel. PIA Bagage Allowance: PIA baggage allowance various depending on your departure point for example if your journey originates from the UK the adult and child baggage allowance is currently 45kg in both directions, the infant baggage is 10kg. For departures from Pakistan where your journey originates from either Islamabad, Lahore, Karachi or any other domestic airport the baggage allowance is 30kg for adult and child passengers and zero baggage allowance for infants, for further iformation please contact us to verify the details provided. Pre-Seat Allocation: Its is possible for travellers to pre arrange their seating on all flights with PIA, online checkin is possible where you are not carrying any checked baggage, pre seat selection can be done while booking your flights or if you visit the airlines website and enter your PNR reference no. Name Changes: In case where your name is siginificantly different to your travel documentation and on your eticket record, you should immediately consult your travel agent, name changes are not always possible however for minor alterations a special remark can be inserted in to your booking to notify the airline, in most cases this is not a problem, there maybe a charge to change or alter a name this depends on the type of ticket you hold and other conditions, a travel agent may be able to assist with this if required and provide you with the best possible solution. Airline alliances: PIA is not a member of a major airline alliance. However, it has partnerships with several carriers. These include Thai Airways, Turkish Airlines, China Southern Airlines and Aerosvit Airlines. Air miles: PIA Awards +Plus is a membership scheme available to all passengers. 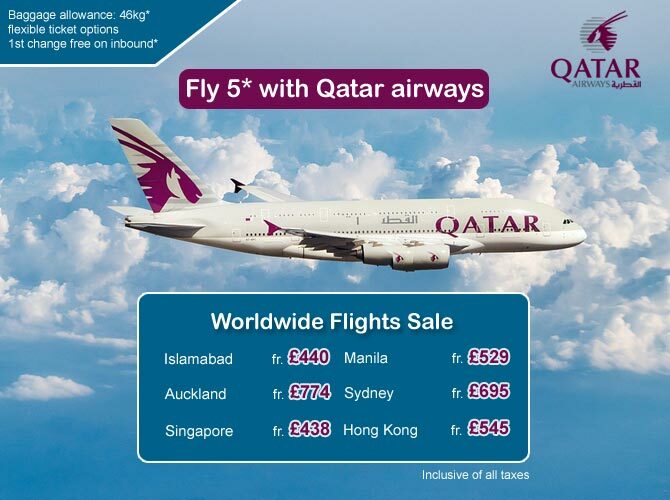 Air-Miles are earned from PIA flights and traveling with its partner airlines. Membership has three tiers: Emerald (entry level), Sapphire (available to those who have taken 25 trips or accrued 30,000 miles in a year) and Diamond (available to those who have taken 50 trips or accrued 70,000 miles in a year). Privileges that A+ Sapphire members are entitled to include checking in at the Awards +Plus counter at the airport and a greater baggage allowance on some flights. Additional A+ Diamond member privileges include kerbside check-in in Pakistan, access to Business Class lounges and access to Pakistani airports, fast-track immigration counters. PIA Connecting Flights: PIA offers connections to over 29 international destinations worldwide via its main hubs located in Karachi, Islamabad and Lahore. Passengers can fly to any onward destination served by the airline for a small fee if booked at time of original booking. 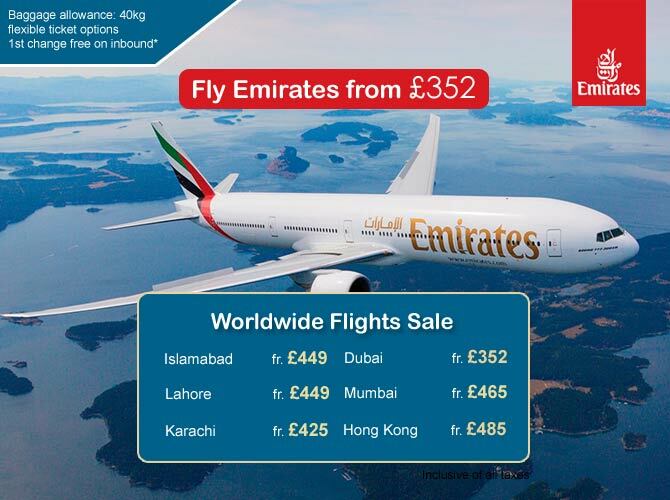 Contact us today for special offers on PIA airlines beyond Pakistan fares list. 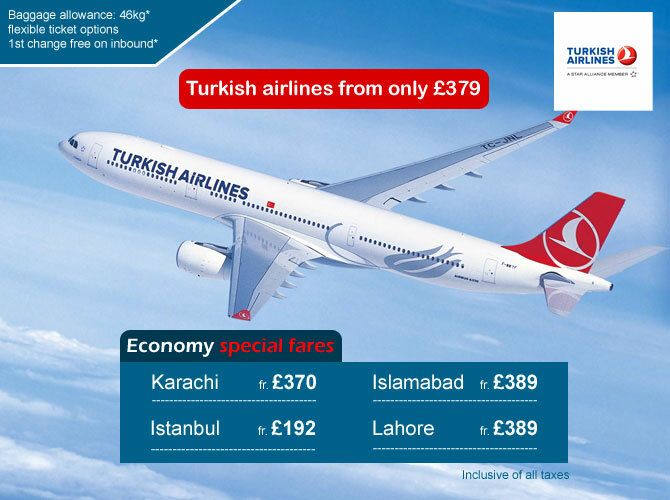 Tip... Mushtaq Travel are able to offer family discounts on pakistan flights departing all airports in England on selected flights during certain seasons throughout the year..
Download our guide to dealing with flight disruptions. Already booked? continue to make a payment using your credit or debit card.